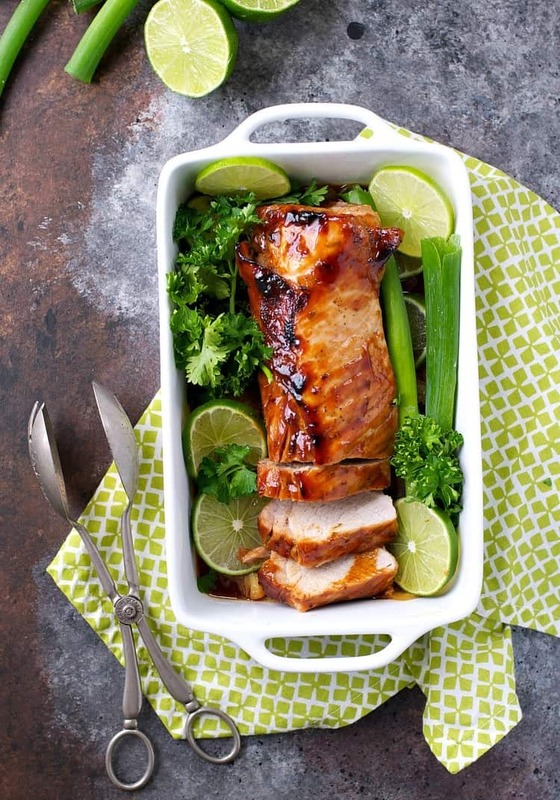 This hoisin glazed pork loin is anything but boring. It's juicy, tender and so flavorful, the whole family will love this! 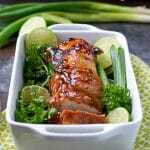 This Hoisin Pork Loin is an affordable, healthy, and easy dinner that only requires 10 minutes of prep. It’s the perfect quick-fix meal to shake up your weeknight routine! It’s so easy to get stuck in a dinnertime rut. Not that there’s anything wrong with repeatedly making your family’s favorite meals, but I often hear that you’re bored with the basics and ready for a change. However, just because you want to try something new doesn’t mean that you’re ready to tackle something difficult. For the first few years of Gibbs’s life, we referred to all pork dishes as “chicken.” Not because we were trying to lie to our child, but because he assumed that the meat on his plate was chicken, he referred to it as chicken, and we just never bothered to officially correct him!? In addition to pork loin, one of the boys’ other favorite foods has always been barbecue. The combination of the sweet sauce and the melt-in-your-mouth meat makes the dinner palatable for even the youngest eaters. The hoisin glaze is sticky, sweet and delicious. You could also it on pork chops, chicken, beef and even salmon. It’s so versatile and is sure to add a flavor bomb to your weeknight dinners. 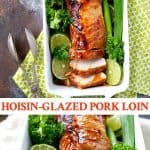 Either way, I know that when I am craving Asian food but I also want the kids to actually EAT their dinner, I turn to hoisin sauce and pork loin for the perfect combination of East-meets-West! It’s barbecue with an Asian twist, and it’s a simple, quick-prep meal that will get your family out of the dinnertime rut. Serve it with rice and veggies on the side for a nutritious, delicious, and simple family-friendly option on a busy night! 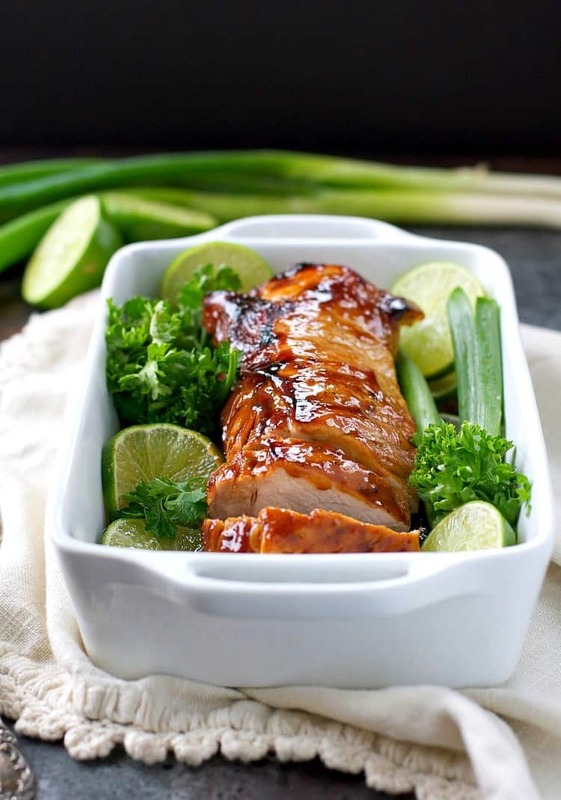 In a small bowl, whisk together hoisin sauce, rice vinegar, honey, lime zest, and lime juice. Brush half of the hoisin glaze over the pork. Remove foil, brush with remaining glaze, and put under the broiler for about 5 minutes (or until a crispy crust forms on top), and pork reaches an internal temperature of 140-150 degrees F.
My husband and I get into a dinner rut every now and then because it can be hard to think of simple meals that don’t take forever to make. 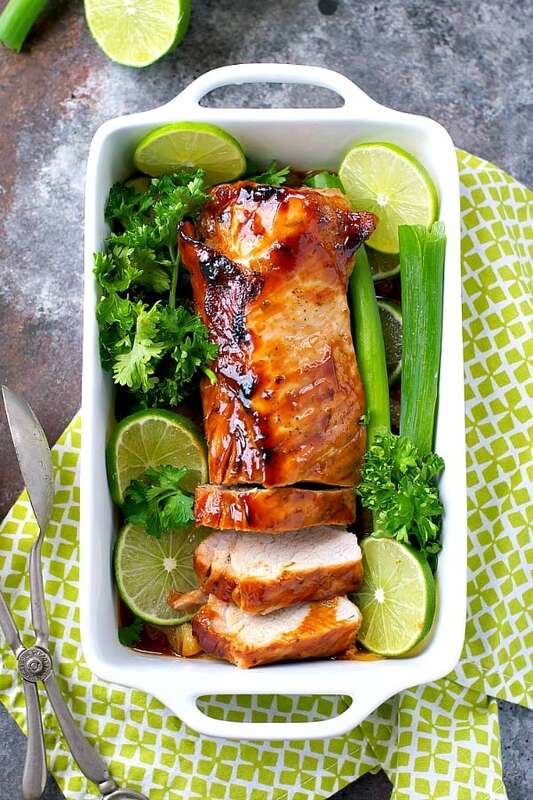 I’m loving this hoisin pork loin, Blair! My husband always wants pork, so I’m going to have to try this! Love that it’s only 10 minutes of prep time, too! Yes, pork is a great way to get out of a rut! It’s easy, but it’s not necessarily something that we make every night (like chicken)! This looks amaaaazing! I need to buy some pork loin next time I’m at the butchers and make this for the whole family! I’m sure it would be a huge hit! Thanks, Kristy! Yep, and it’s so easy! I love pork so much, but I am never good at cooking it in a way that doesn’t dry it out. I think this recipe might be my answer! Yes, Kate! You definitely need to try this version. 🙂 No dry pork allowed! That hoisin glaze sounds SO delicious, I’ll be using this on my next pork roast for sure!